Coming out of the gates like the mightiest of monsters crawling from the blackness of the mind, Seven Spires debut EP “The Cabaret of Dreams” is one of the most solid pieces of symphonic metal in the past decade, due in large part to stellar composition, production and character that most young groups only dream of. One of the first things that the listener will likely notice about this release, in fact, is a key example of what sets Seven Spires apart from others: instead of playing like a mixed-bag EP, their first bit of material actually plays the concept album game, and plays it well. The 26-minute CD plays like a Dream Theater-esque epic a la “The Count of Tuscany” or “A Change of Seasons,” except that it demands to be listened to again and again. Each of the three times that I popped this disc into my car stereo, I listened to it at least twice consecutively. That’s not laziness – that’s this reviewer being floored by the talent of this group. The group is fronted by Adrienne Cowan, who also handles the impeccably tasteful keyboards and orchestrations. By the halfway mark of the EP, Cowan locks herself in as a powerful vocalist with character to boot. 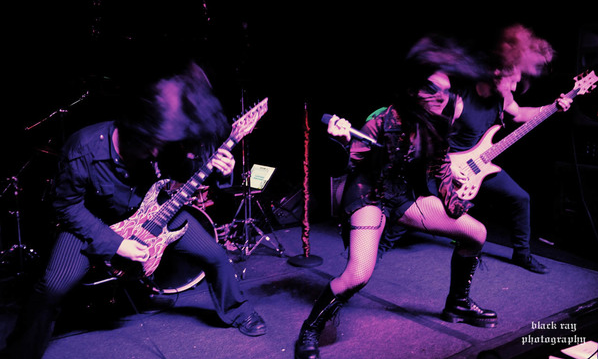 Equal parts Simone Simons and Alice Cooper, Cowan doesn’t just ask more radio-friendly singers like Tarja Turunen or Lzzy Hale to step aside – she sounds as though she eats them for breakfast. Looking back at the individual tracks, the most noteworthy aspects of the structure are in the first three tracks and the final one. Clearly inspired by opera and classical music, listeners will find themselves entranced and imprinted by the simple yet brilliant theme that persists throughout the beginning of the album. “100 Days” is a far calmer composition than the soul-stealing sideshow on the rest of the EP, but as the last track, it ends the CD on an interesting note, one that showcases the range symphonic metal has been known to demand from its best groups, while also leaving the same need to revisit and await more material from Seven Spires. The excellent taste that Seven Spires displays in their composition and orchestration is further exemplified by my personal struggle to recall, after first listen, if this EP contained any of the typical death-growls or screams that female-fronted bands are wont to employ while trying to enforce a “heavier” sound. After listening again, I was actually rather impressed: while these kinds of added vocals are present, they are neither extreme nor overused enough to give the band’s admirable style any kind of “me too” vibe, in the crowd of other bands that they draw comparison to.